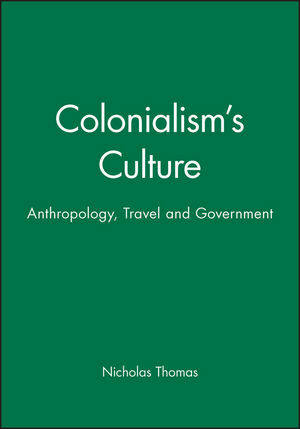 This book explores the perceptions of colonized populations that have developed over the course of European expansion and critically assesses different approaches to colonial representation. Nicholas Thomas is the author of several previous books including Out of Time: History and Evolution in Anthropological Discourse (Cambridge University Press, 1989) and Entangled Objects: Exchange, Material Culture and Colonialism in the Pacific (Harvard, 1991). 1. From Present to Past: the Politics of Colonial Studies. 2. Culture and Rule: Theories of Colonial Discourse. 3. From Past to Present: Colonial Epochs, Agents, and Locations. 4. Colonial Governmentality and Colonial Conversion. 5. Imperial Triumph, Settler Failure. 6. The Primitivist and the Postcolonial. * This is a topical subject area which draws not just on anthropological material, but also on literary and historical sources. * The book provides a good introduction to the whole field of studies on colonial discourse and histories - discussing, among others, the work of Said and Bhabha. * The book is illustrated with pictures and texts.